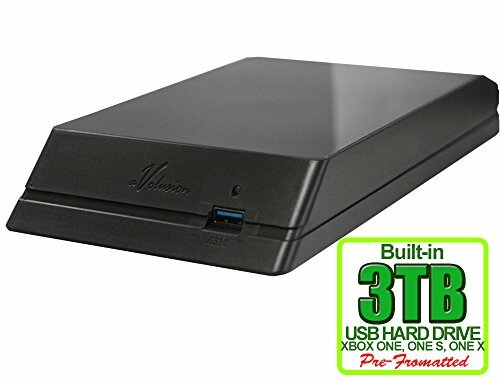 Avolusion® HDDGear HDDGU3 3TB (3-Terabyte) External Gaming Hard Drive is the value hard drive upgrade kit provides the best and easy solution to expand your XBOX ONE game console storage capacity instantly! Plug and Play USB 3.0 interface providing a perfect portable storage solution for you to store & backup your game data, music, picture, video and more! Avolusion® HDDGear External Gaming Hard Drive designed to work with your XBOX ONE game console perfectly! (Fully compatible with XBOX ONE, XBOX ONE S, XBOX ONE X). It comes with silent fan-less design to keep your External Gaming Hard Drive operate quietly! Avolusion® HDDGear HDDGU3 External Gaming Hard Drive Upgrade Kit features high-quality construction, advanced external interface technology, durable chassis and state-of-the-art industrial design, assured to provide you with years of reliable performance. XBOX File System Pre-Formatted, Expand XBOX hard drive storage instantly! If you have any questions about this product by Avolusion, contact us by completing and submitting the form below. If you are looking for a specif part number, please include it with your message.